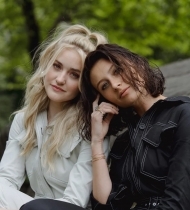 We got a few photos from the new photoshoot of Aly & AJ for Paper Magazine. The ladies look so gorgeous in these photos, and we love their black and white outfits. We have added 8 photos to the gallery, and you can also check out the interview of Alyson and Amanda for Paper Magazine by clicking here. Your Ten Years EP came out in 2017, and you’ve just started regularly performing those tracks live on tour. How does it feel now having some separation from the project? AJ: The EP came out in November and now performing those songs for the first time live is really rewarding. I think it was good that there was a little bit of a gap [between the release and tour] — we’ve got to enjoy the response, we’ve got to hear people’s thoughts on the EP, and then really take the time to figure out the live aspect of it. We’re playing old songs, we’re playing new songs, we’re playing a couple of unreleased songs, we have a couple cool covers. And I’m really proud of the music, I think it has translated beautifully live. 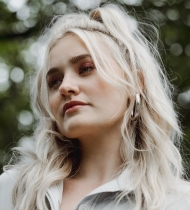 Aly: AJ sometimes is a little bit more into what’s new and cool music wise, cause I just feel like you listen to a little bit more music. AJ: I like to discover, I’m a music freak. So for two years every day it was like, “You gotta listen to this, you gotta listen to this.” Some things I would hate, some things I would love. I brought that into our band a little bit, and it helped inspire some cool ideas because I discovered these bands, whether they were Vancouver bands or from LA, or wherever, and it helped form a new group of inspiration that Aly and I didn’t originally have. But we’re both music lovers and both super similar in our love for things. And we hate the same things. Aly: Yeah, usually. We’re like 90% on the same page. AJ: No, I don’t think we’ve ever questioned that. People have asked, “Would you ever do a record on your own or like change up genre, or split up.” For me, this is where I feel the most comfortable, in our music as a twosome. Acting is obviously something we keep more separate. When it comes to music, I wouldn’t really want to do it alone. I wouldn’t find the same excitement for it, either. Aly: It’s also just a lot to take on as a solo artist — all aspects of it, not only just the singing, but the speaking during shows, interviews, everything is all on you. Aly: I also understand that people sometimes don’t get along forever, and that’s why a lot of bands break up, because they’re not family and something happens and it pisses the other person off and they all of the sudden want to make completely different music, or they want to have a family, or they don’t want to tour and the other three members actually do. So much of that changes things and it helps, I think, that we’re siblings, at least. AJ: You’re looking long term. AJ: We’ve never been more in control. The decisions, like before a song goes out, or an image, or what, that’s all Aly and I, which is really cool because, as an independent artist, it’s really rewarding to have every decision be made through you. Not because you need to be the one in the power position, but because it is your music and so, every chance you put something out, it’s so personal, that it better be exactly what you want. Aly: And if they’ve been doing it for a while, I feel like the artist knows what their fanbase wants and what their fanbase is expecting, or likes, or enjoys. Aly: Yeah, it doesn’t make any sense, like they don’t know! Aly: I mean, like my dad, he has great taste in music, but it’s the same thing as him choosing what our album cover should be. I mean if we let my dad choose that, it’d be like shocking. AJ: He’s really proud of us, but he was definitely confused.